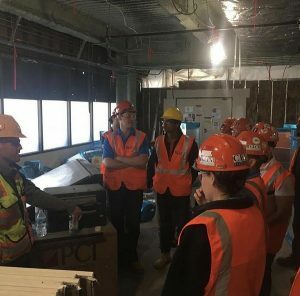 After this morning’s Walsh Shea joint venture tunneling project and our last lunch in L.A., we met up with a few Hensel Phelps representatives at their LAX project site. 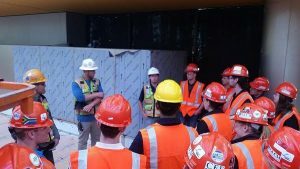 Bill Armstrong, David Herren, Tanner Blumenfield, and Mike French did a great job of introducing to us their project scope and explaining their roles on the job. The GLCM group listens as the HP representatives describe the project. 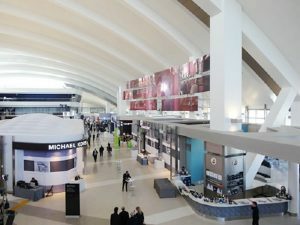 This project consists of a large amount of renovations in terminal 7 of the Los Angeles airport for United. 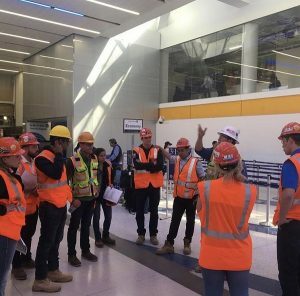 Hensel Phelps (HP) has plenty of experience with this as they have worked on similar projects in terminals 1, 2, and 6 as well as the international terminal. 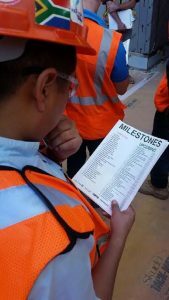 The contract with United was a Construction Manager at Risk contract, with a guaranteed maximum price of $400 million. The duration is 4 years. There are approximately 70 salary staff from HP on this site, split between field engineers and managers on the site as well as in the office. There are plenty of other subcontractors on site, but HP does self-perform concrete pouring. 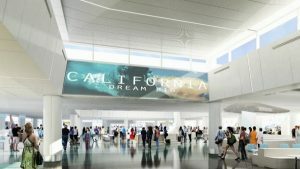 What we found most entertaining and interesting about this project was the amount of constraints and complications that come along with a project at an active airport terminal. A lot of the constraints on the job come from having to deal with numerous agencies and entities. Not only do they have to work and be collaborative with United, but they have to work with the TSA, Customs and Border Patrol, the airport and their staff such as janitors, the police, and the maintenance crew, concessions, etc. HP really has to work around these entities. For example, the TSA delayed giving HP one of their lobbies a few weeks because of the busy winter season. Because of this, the schedule has to be compressed and in order to adjust, HP has to work tougher hours, more days a week, etc to finish on time. This lobby, which is near finish, is actually due to be turned over in a week from today. It was cool to see this because by just looking at it, one would guess it would require a week or two more than that to complete. It really is crunch time for this part of the project. Another problem that aids to the scheduling of the project comes from the timing constrictions given on certain activites. HP work can only be so loud during certain times of the day and do any work at other times of the day. Combined with the congestion and size of the airport, this results in a loss of 25-30% production. HP has to do their best when accounting for this in estimating schedules and the such. Another challenge that exists with this project is the utility connectivity. For example, when HP needs to shut down electricity for a period of time, all the electricity in the terminal is shut off for that time and in turn the terminal is useless until power is turned back on. Whenever any utility is needed to be turned off, HP must request it 30 days in advance, and it must be approved. So not only is approval not guaranteed, but it has to be requested about a month in advance, which requires a lot of planning. A random but funny story we were also told is of an unreasonable flight passenger. An older lady who was supposed to be flying out of the terminal had a pet cat and she was not aware of all the fees associated with bringing the cat along on the flight. In her anger, she took the cat out of its carrier and threw it across security. It proceeded to scurry away and hid on an upper level. HP was asked to help locate and capture the cat. This clearly is not contractual but HP had to do what was requested of them in this situation. This is a bit unusual and ridiculous but in the end is a funny story. Tanner talked a little about the company and his experience with them. “Working for HP is fun because of the responsibility put on you, especially with surveying tools and methods.” Many of us have taken surveying at UIUC so this is reassuring to know our skills may come in handy. Personally, after talking to these guys, I’m excited to intern with HP this summer. It should be very eye-opening and I’m excited to potentially, in the end, “earn my title as a project engineer” – Tanner.